Fall! And except for the lack of rain, the weather has been glorious. Walk through the neighborhood and treat your visual senses to the spectacular color of our trees. But once those leaves are on the ground, you’ll experience another sensory overload: the constant din of leaf blowers. Six days a week, at all times of the day, there is the racket of a leaf blower to be heard somewhere in the neighborhood. Just listen to this example (you might want to turn down the volume). Here’s our pitch to reduce the auditory assault of these machines and use a rake instead. It’s great exercise and also helps out wildlife, trees and plants. Plus, nothing is more fun than playing in a pile of beautiful fall leaves! 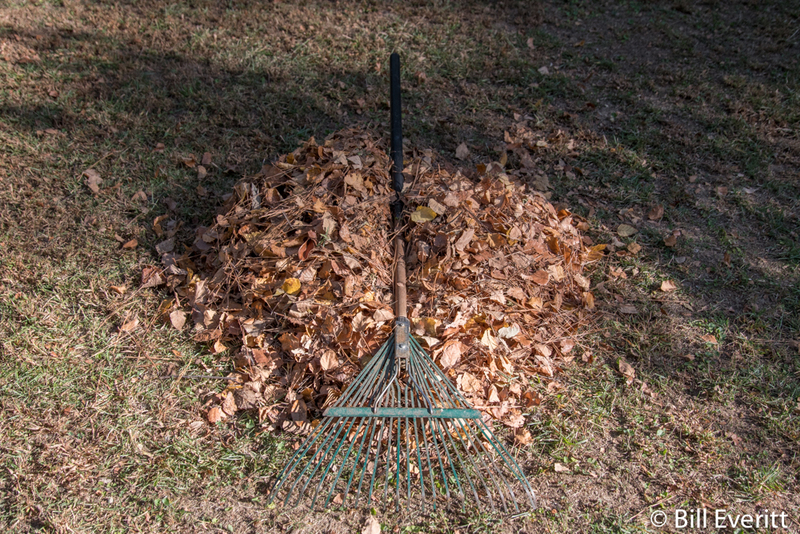 While a layer of leaves is not good for lawns, other plants and trees will thrive with undisturbed leaf litter. If the leaves are removed, so are the nutrients that feed the plant. Lawns also benefit from a light layer of chopped leaves (the mulch setting on most lawn mowers). Smithsonian: Where Do Insects Go in the Winter? This entry was posted in Bird Song, Brush Piles, Fall, Leaf Blowers, Noise Pollution, Rakes and tagged Brown Thrasher on October 30, 2016 by beveritt. All leaf blowers should be banned. Also, those who throw the leaves in a burning barrel and let them smolder — If you are going to burn something, burn it! Yuck, that horrible smoke. Looks like North Carolina! Beautiful trees.Thanks for including obnoxious leaf blower as a contrast to the peaceful beauty of fall – hope people will think about taking out the rake instead. Some probably have not even thought about the noise or the contrast.